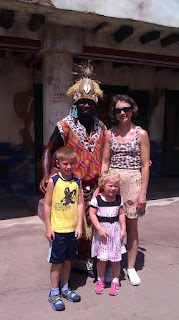 Our destination on Wednesday was next Disney World theme park - Animal Kingdom. From personal impression it is just little smaller than Magic Kingdom, but much better organized in terms of access and park structure. Parking is very large but close to the gates - depending on where they have parked you (all parks have staff pointing you a spot) you may take a tram or just walk to the entrance. 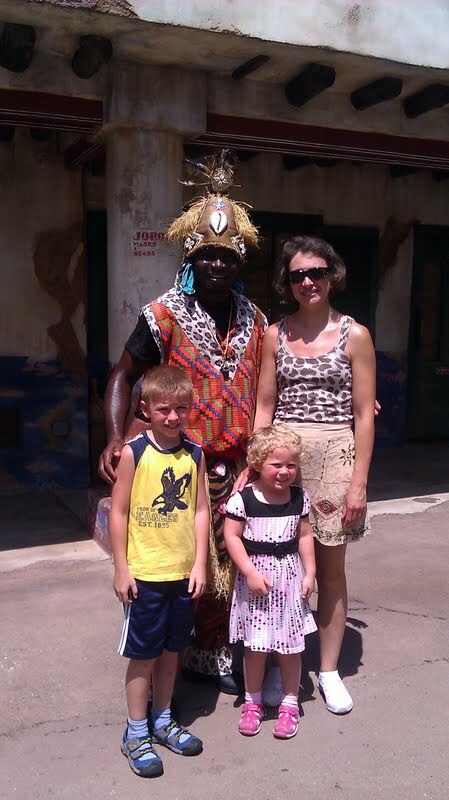 Park itself is not that much about the rides - it is mainly about animals and their geographical habitats. It is not a zoo, though - it is a little bit of everything. There are some live animals in cages or larger enclosures (couple of gibbons simply walked ropes above the walking path). Some attractions are more museum-of-science types of exhibitions and shows talking about exploration of live nature from different standpoints. Then there is a safari ride - 20 minutes trip in the open off-road vehicle that shows you tons of animals - few kinds of antelopes, elephants, rhinos, lions, crocodiles, buffaloes - you name it. It is a lot for 20 minutes - you do not see animals long enough to say if they are real or fake (we have never reached an agreement within our group which ones were live and which not) but definitely, I have never seen these kinds of animals so close and so active daytime. Cheetahs in the zoo are usually sleepy daytime - ones here were running. Like in other parks, whole territory is split into zones which in Animal Kingdom are mostly different world continents (so, safari is in Africa, Everest ride in Asia etc). Africa is actually pretty decent imitation of remote African village. Few rides that are there are quite decent - Peter and myself have enjoyed "Trip to Everest" and dinosaur ride - last one looks like great stylization of "super-science-fiction" scenes from 25 years old James Bond or Van Damme movies. Very tired from long day in Magic Kingdom, we have decided to choose more relaxing park and took off for one of the water parks. 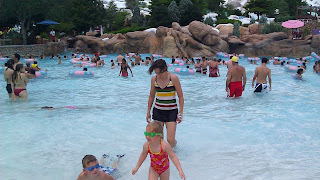 There are two water parks in Disney World, and we ended up in Blizzard beach simply it was first one we noticed on a road sign. In all respects we have gotten much better experience than in Magic Kingdom. From the very beginning: park is much smaller and parking is small enough so you can just walk to the gate. There is no bag search at the gate and nearly no restriction regarding what you can bring with you - we saw people pulling large wheeled cooler. Park itself has a large pool with generated 2-3 feet waves - not enough to make playing in the water difficult, but quite enough for kids not to get bored. Surroundings and most of the rides imitate ski resort, nicely contrasting with 96 degrees in a shade. There is much less rides than in other parks, but lanes on most are short which makes them quite accessible. One that we liked most was advertised as "longest raft slide in the world" - they put whole family in one large round raft and send it down long curvy open slide - indeed, unusually long.